British Columbians spend a lot of money and time on their Lions Bay properties. The town is known for its scenic beauty and proximity to the sea to sky highway. It takes a lot to keep these properties functioning and looking great. Why wouldn’t you want to see the fruits of these labours? Surveying your scene through spotted windows does not five the best impression and sitting dirt definitely isn’t great for their overall well-being. One round of our Lions Bay window cleaning can keep your windows in good condition while providing you with a brighter view. Keeping your windows clean is easier said than done. Most windows are often high-up and can be nearly impossible to reach. Just because they are our of your reach doesn’t mean that dust, dirt, debris and droppings can’t reach them. The piling up of these materials happens over time but it also happen consistently. You might not notice the difference day to day but one day, those spots and streaks will be impossible to ignore! Approaching the windows around your property with the wrong tools does less than nothing, but knowing which tools are the right ones can be difficult. More often than not, an ordinary house cleaner and a roll of paper towels seems to get the job done but it is not enough. It is no secret that a little bit of elbow grease is necessary when it comes to getting your home clean, but your windows have different needs than, say, a dining room table. The friction caused by wiping paper towels across the surface of a window creates a static shock that attracts airborne materials like dust. This can leave windows looking dirty very soon after their initial cleaning. Instead of contending with this issue, our Gorillas have created a new method. Rubber squeegees are our secret weapon. 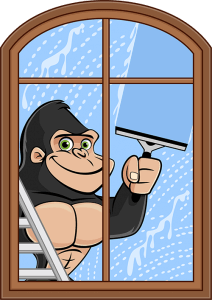 These tools allow Gorilla technicians to reach every nook and cranny and corner of your windows without the threat of static charge. As for those hard to reach panes, water-fed poles allow our Gorillas to reach surfaces up to four storeys high. 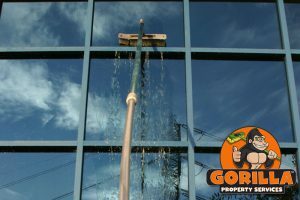 Whether it is a sill, a frame or the glass itself, no dirt is safe with our Gorillas on the scene!